We at Bijli Bachao have always mentioned that instant water heaters are the best for electricity saving, however they increase the load on your electricity distribution. In fact we wrote about in detail in our article: Instant water heater/geyser: may be good for individual but bad for system. If you do not go for instant water heater then the next best choice is to go for smallest sized water heater (read more at: Choose the right sized water heater/geyser for electricity saving). However most small storage water heaters do not provide sufficient hot water in most conditions and in fact in colder cities the instant water heaters do not work effectively as the rate at which they heat water is very low. But if you are someone who is looking for small storage capacity heater and also want fast, energy saving water heater that can give continuous supply of hot water for a long time, then you should go for a gas based water heater. In this article we will give you some numbers to compare. This shows that gas water heating is at least 50% cost saving as compared to electric water heater if you have subsidised gas or PNG. Gas water heater has 85% efficiency, how is it energy efficient? Gas is a primary source of energy i.e. it is extracted and used as is and the only losses are during transportation and those are minimal. Where as electricity is an secondary source of energy. It is generated using coal or other forms of fossil fuel. There are inefficiencies in generation, transmission and distribution of electricity. In general it is said that there are 15-30% losses in India. So using electricity in itself is not as good as using the fuel directly and thus using gas for heating water is energy efficient. 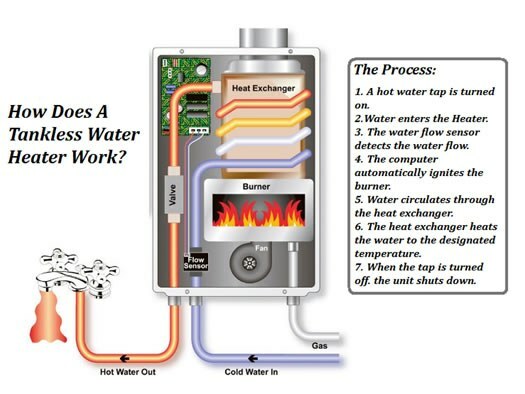 How does Gas Water Heater work? The technology behind a gas water heater is a very simple one. The water moves through a pipeline which passes through a heat exchanger. The heat exchanger has water pipe covered with fins and there is a gas burner below it. The gas burner is ignited using an electric impulse created using the inbuilt batteries. The flames heat up the fins which in turn heat the water. And the hot water is obtained from hot water outlet. The system starts up the moment you switch on a tap and switches off immediately after you close the tap. Are these water heaters safe? Never install it in a closed space (like bathroom). Make sure that there is good ventilation. Avoid keeping it close to inflammables, explosives or corrosives. Also avoid any electric wiring close to the water heater. Make sure that connecting pipes are leak proof, anti corrosive and clean. Keep it at a height at which you can easily see the pilot flame. Never leave the gas water heater on (or the tap on) for long time. Are there any specific buying tips? First and Foremost, BIS or Bureau of Indian Standards have specific safety and performance standards for gas water heaters. So always buy a gas water heater with ISI mark. Do not buy unbranded gas water heaters. You should make sure that you have space to install the water heater. 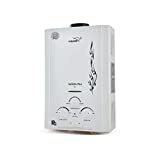 As mentioned above make sure that you have a space with good ventilation. Some good brands as per Consumer Voice Report (link) are: Kenstar, Crompton Greaves, Marc, Venus, Racold and Bajaj. Choosing the smallest possible water heater is the best way to minimize your electricity consumption and also costs. However smaller water heaters may not give you sufficient amount of hot water at the right time and longer duration. If you have an option to install a gas water heater, then that is the best to save both energy and costs.